Deluxe Advanced Squad Leader (or DASL, as it is more commonly referred to), has long been the red-haired stepchild of ASL, perhaps even more so than SASL, insofar as SASL even had a 2nd edition and a variety of supplements for it. But DASL spawned only two early products, Streets of Fire and Hedgerow Hell, then (due to lack of popularity) essentially fell by the wayside. Official support consisted only of the occasional scenario released for it, while third party support consisted mostly of the same, except for a couple of third party DASL geoboards released by Bounding Fire Productions and Heat of Battle. 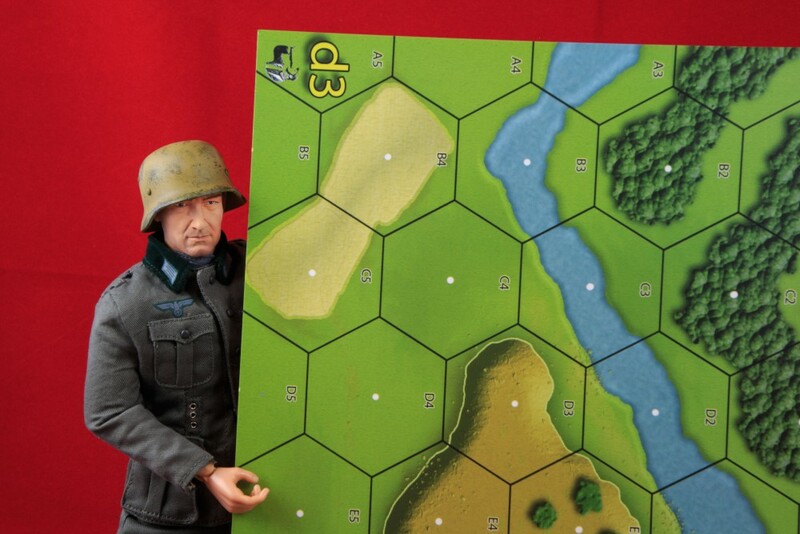 The problem with DASL is that it was designed to be a crossover product for miniatures enthusiasts, but by and large, miniatures players rejected it (there are occasional isolated exceptions). 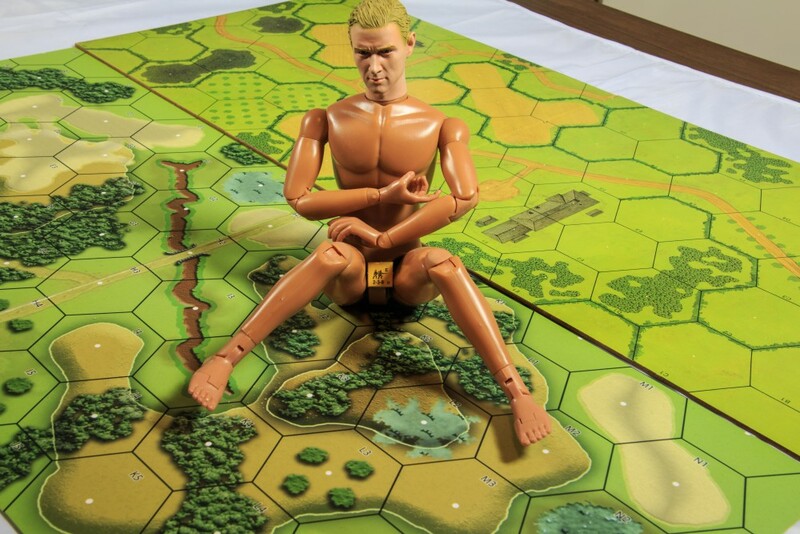 DASL has little to offer traditional ASL players except bigger hexes–but the hexes are so very big that the maps are physically inconvenient at the same time they represent only a tiny cartographic area. Despite this fact, there have always been some players who have championed DASL, and more players who like to take an occasional dip in the DASL pond. Over the years, various publishers, official and unofficial, have bruited about the notion of a new DASL module or a DASL map pack or something similar. However, none of those ever came to pass. Until 2014, that is, when a group of DASL enthusiasts led by Dave Ramsey (of ASL Scenario Archive website fame) took up an unfinished DASL notion from Steve Swann and brought it to completion, arranging with Le Franc Tireur to do the physical production and publishing. Deluxe Pack #1 (which by its very title threatens sequels) thus becomes the first DASL-dedicated product to be published since 1987, a rather remarkable feat. Obviously, the main thing the Deluxe Pack has to offer is its new boards. The pack comes with 7 of them (d1 through d7), which is a rather generous amount. Each are printed in full color on light cardstock, just like modern official geoboards. 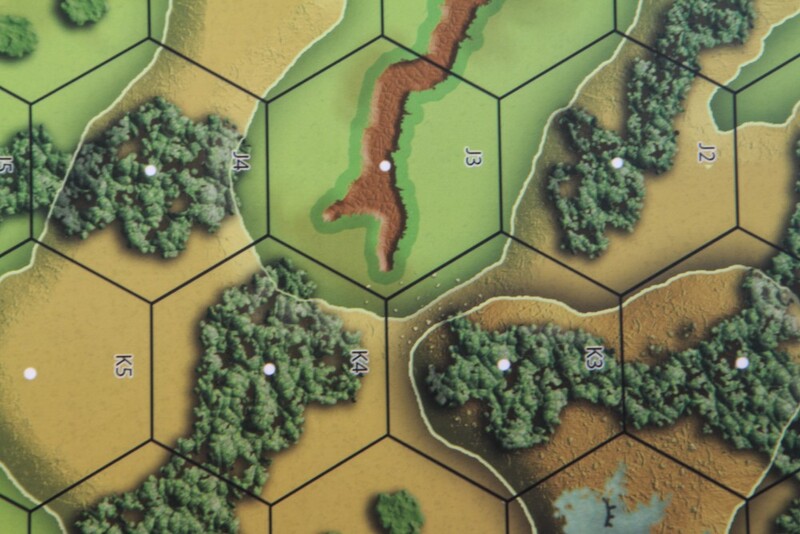 Whereas Streets of Fire featured dense downtown urban terrain and Hedgerow Hell featured bocage, Deluxe Pack #1 tends to feature a variety of more rural or wilderness themes. This also allows DASL to visit the PTO in a way that just could not really be done before. 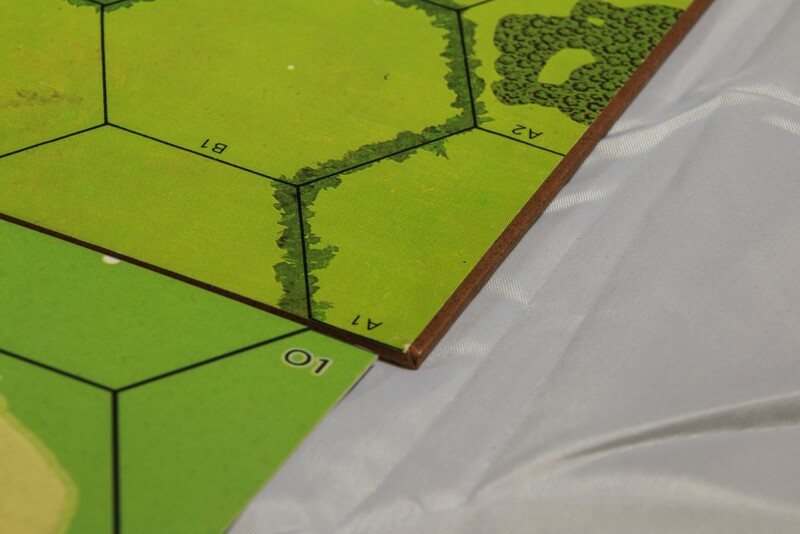 d1: A rural board centered on a collection of 8 hut hexes, with some fields and orchards surrounding them. 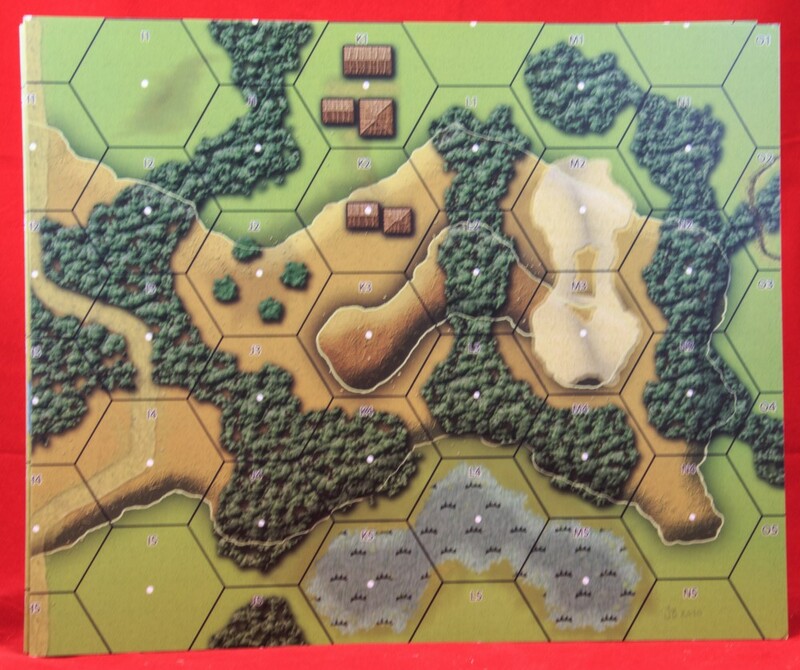 d2: A board dominated by a large hill, mostly level 1 but with three level 2 hexes, that is almost completely covered with woods/jungle; there are also two hut hexes. 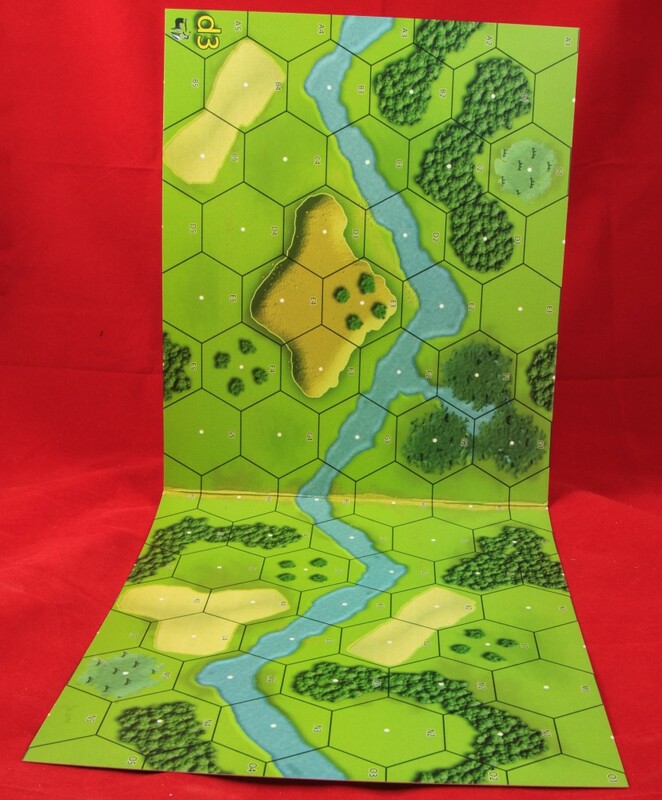 d3: A wilderness river board (river is only one hex wide, though) with no buildings. 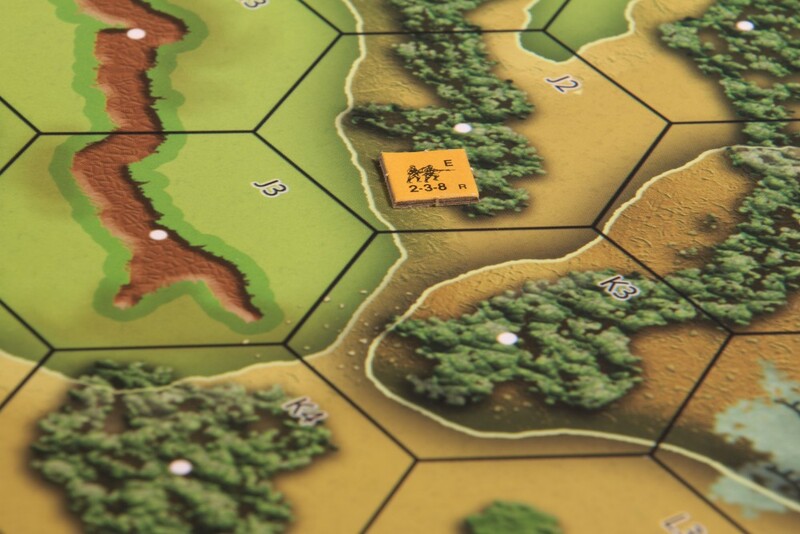 d4: A rural board with a large orchard, some grain fields, and the only non-hut building in the pack, a two-hex, two-story wooden building. 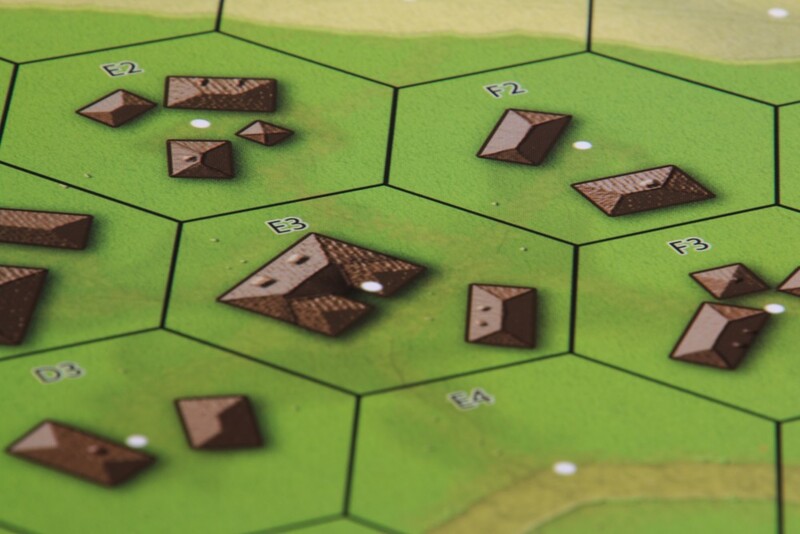 d5: A collection of six hut hexes next to a road that traverses the map, with woods on either side of the huts. 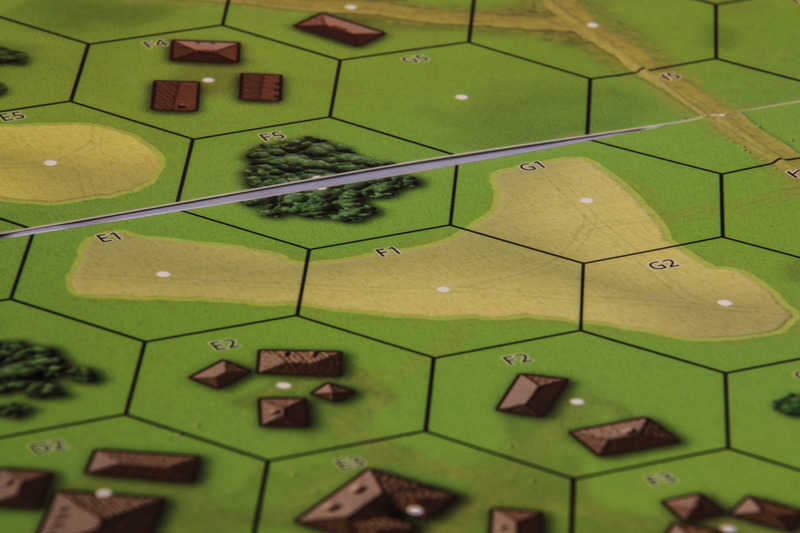 d6: A tough wilderness board, featuring three hills 9one of them 2-level), with a couple of hut hexes. 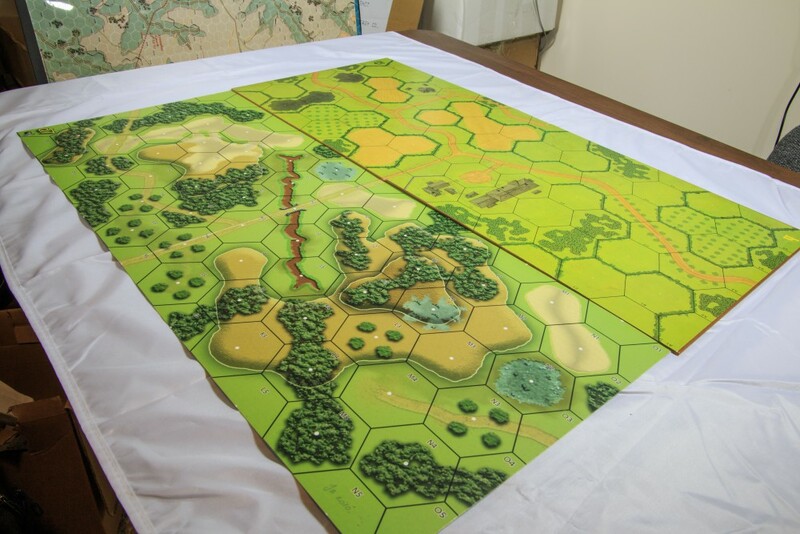 d7: A tough wilderness board, featuring three hills (one of them 2-level), with grain (more likely, kunai) and woods (more likely jungle). Overall, the mix of boards is an interesting one. There is a clear emphasis on wilderness and/or PTO-compatible boards here. Some can fit with Hedgerow Hell maps, but mating them with Streets of Fire maps would mostly be a bit jarring, as they contrast so much. With Streets of Fire and Hedgerow Hell, the artwork was designed to ape standard ASL artwork insofar as it was possible. That was not the intention here. Rather, the producers went in the opposite direction and created very new and very different digitally-derived artwork with a heavy reliance on textures. This makes them look very different indeed from official DASL maps. The nature of the artwork may well end up having a polarizing effect, as it has a strong and distinctive style that nevertheless may not be to everyone’s tastes. In some respects the artwork succeeds well and is attractive, but in other respects there are lesser or greater problems. Buildings. The building artwork is very attractive–the artist even has different styles for building hexes that are “intended” to be used as PTO hut hexes and building hexes that are more “European” in nature. The buildings all have shadows around them, which is usually a mistake, as such shadows make tracing close lines of sight more difficult. The artist did put a black line around all the buildings, which can help players make some such distinctions, but a few buildings have such dark shadows that the black line may not be enough. Woods. The woods artwork is very good (among the best woods artwork for ASL), but marred slightly by shadows that can make tracing LOS difficult. Roads. The road artwork is unobjectionable. It works well blending with woods and orchards, but looks weird on hills. Brush. The brush artwork is very nice. It is very similar to official brush artwork but actually looks nicer. Orchards. Unremarkable. 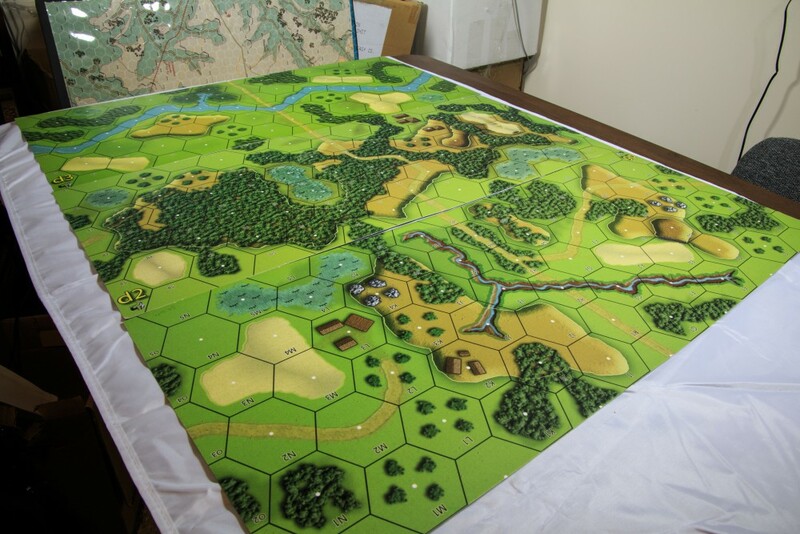 They look a tad more blurry than woods hexes but nothing objectionable. Grain. Generally okay. A bit more beige than yellow and rather roundish. Grainfields on the “rural” rather than “wilderness” boards tend to have faint little tractor or plow marks on them, which is an interesting little touch. Marsh. 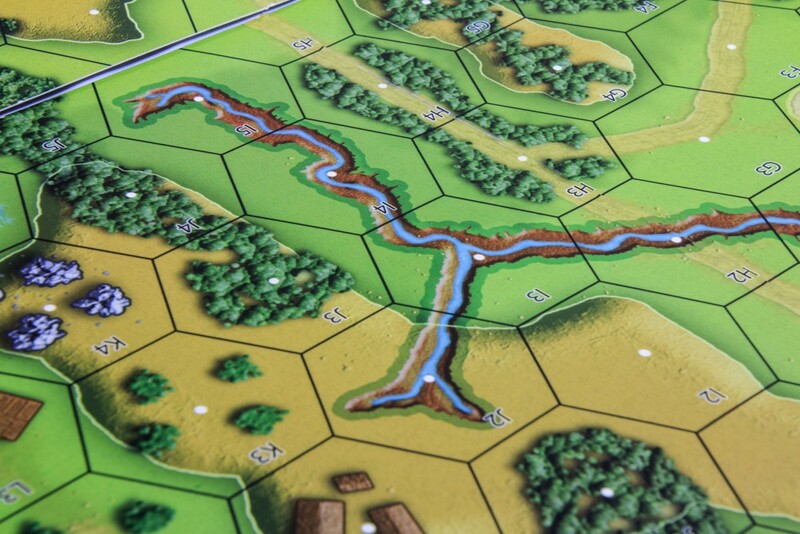 One of the big graphic failures–the marsh hexes look blurred and out of focus. Also, they look a bit like pools of vomit. River. Not a very good job here–the river and its banks appear blurry and out of focus. Streams/gullies. This is another problematic terrain type. The 3D effects of depressions and elevations are very tricky and hard to get right and in some wargames the effect achieved is exactly the opposite of the one desired. Unfortunately, that is the case here. Many eyes will look at the gully and stream graphics on these maps and perceive them as rising above the surrounding terrain rather than sinking below it. In part this is because of a decision to apply highlights and shadows. Cliffs. A bit non-intuitive but generally recognizable and unremarkable. Hills. Of all the terrain types here, the hill depictions are among the most problematic, for several reasons. First, the 3D effect is not handled well. The main problem is that the artist applies a shadow around the entire border of a elevated hex. What this does is to make every hill look like it is floating above the ground, and to make level 2 hill hexes look as if they are floating above level 1 hill hexes. Shadows should only have been applied on one side of these features, not all the way around them. Second, the various techniques and textures used to make the hill look 3D conflict with the techniques used to provide game functionality (like a white line around all elevation levels to help distinguish lines of sight. The result is that when other terrain types intersect with hill boundaries it usually looks a bit weird. 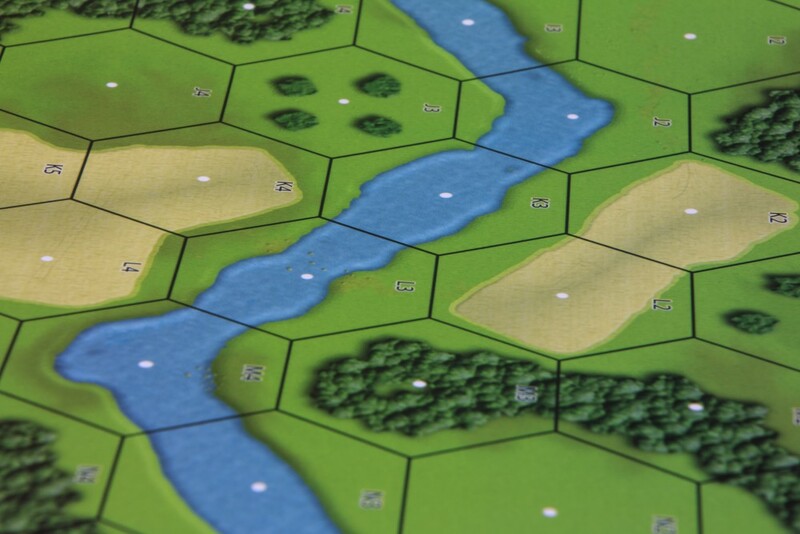 Lastly, there is not enough differentiation in color between level 1 hill hexes and level 2 hill hexes. 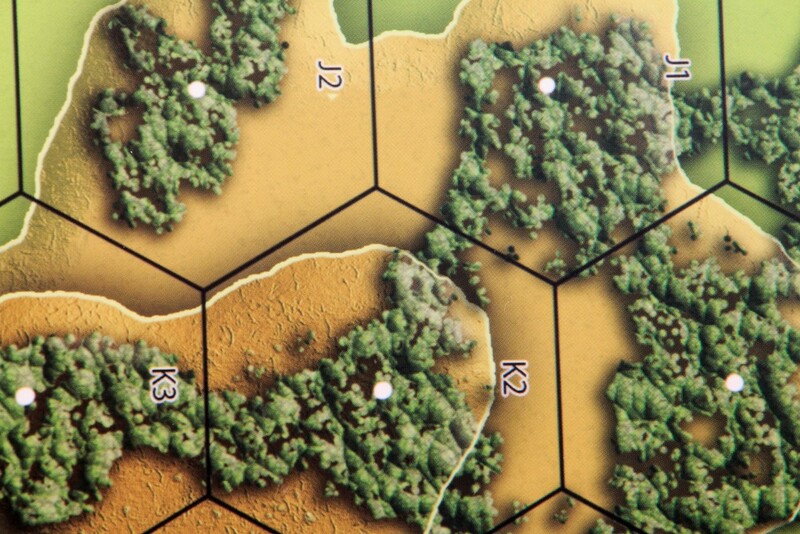 There is also a bit of mystery terrain, such as hex d2O2–is that a path (to nowhere?)? A glitch? Some people will like the terrain style, others will hate it. For the most part it is functional and not too objectionable, although there are some clear areas for improvement if there are follow-on products. One other aspect to the maps must be pointed out: they do not mate up exactly with official DASL boards. This is due not to a mistake (such as the erroneous hexgrids that have plagued recent Critical Hit geoboards) but rather due to an odd feature of the original Streets of Fire and Hedgerow Hell boards. 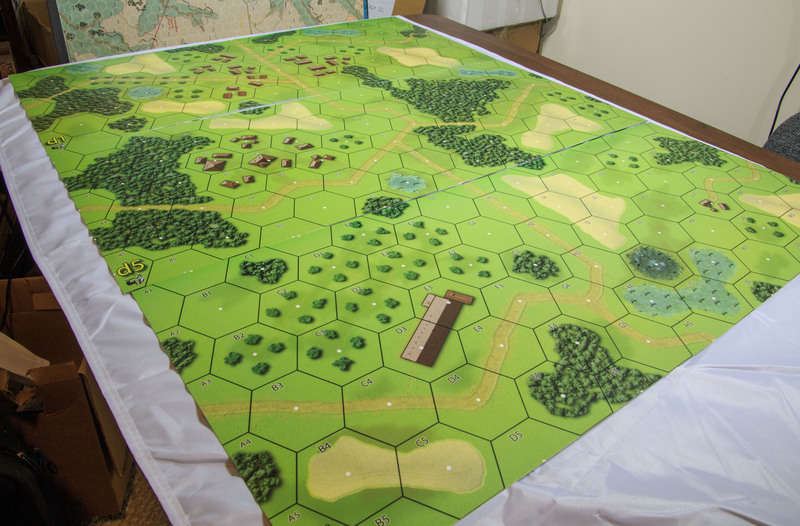 Those boards were all mounted boards, with a paper map glued onto what were essentially thick sheets of cardboard. The way these mounted maps were put together, so that they could be folded, required an indentation down the middle of each board, and required the glued maps to dip down into the indented area (to accommodate folding). As a result, on official DASL maps, the center row of hexes is actually slightly narrower than all other hexrows, which means that when a Deluxe Pack map is lined up against an official map, it will mate perfectly on one half of the map but be slightly off on the other half of the map (the half beyond the center row). 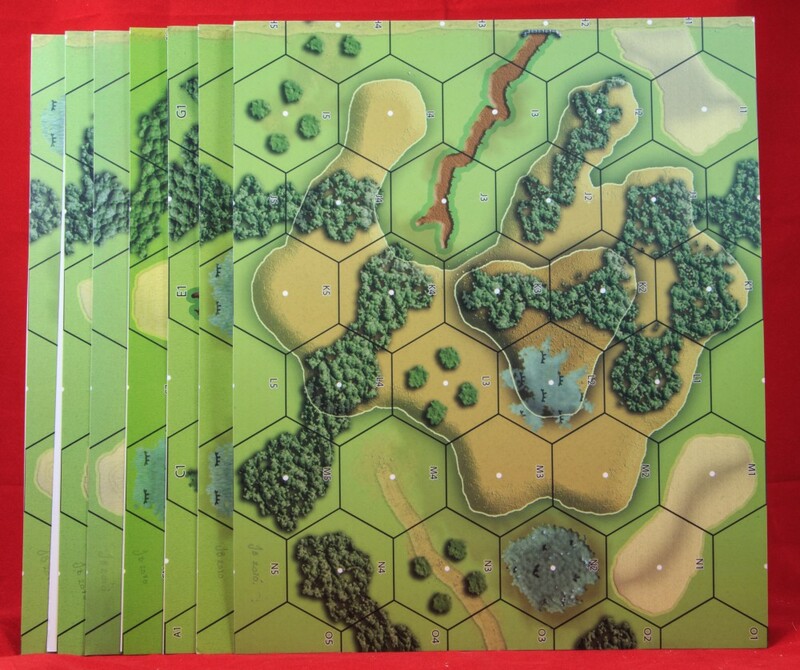 Those people who may have unmounted official DASL maps purchased from Avalon Hill or MMP probably would not have this issue–it is likely to exist only with mounted maps. Thus this is an odd instance where the third party boards are more “correct” than the official boards. The good thing is that DASL maps contain so few hexrows that, though the problem is visually obvious, there is not enough room for it to cumulatively grow and become a true functional or practical problem. The difference remains small enough that there probably won’t be any significant practical, as opposed to aesthetic, effects. Deluxe Pack #1 comes with 12 scenarios, designed by a diverse set of hands (some of them relatively new to scenario design), generally an Anglo-American mix with a hint of the continent thrown in. 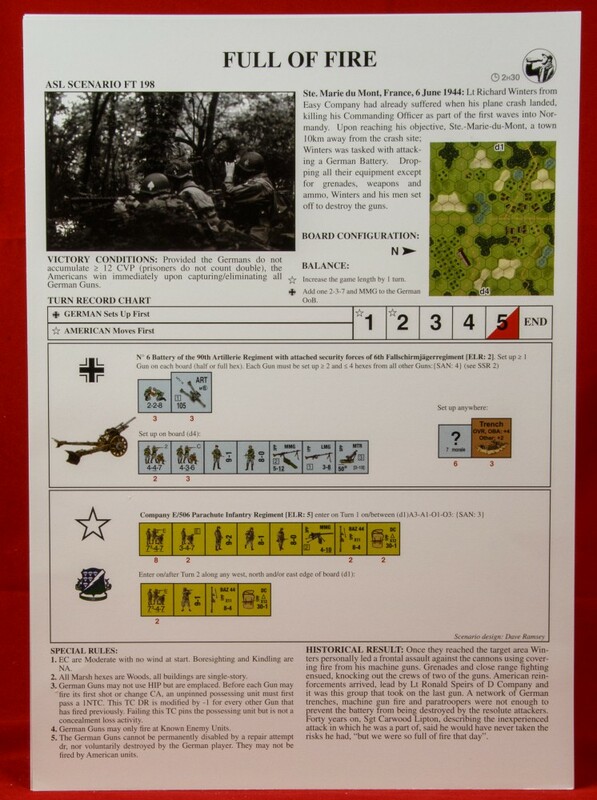 The scenarios are all printed in color on glossy light cardstock using Le Franc Tireur’s latest color counter artwork, which for vehicles is nice but which for SMCs/MMCs sometimes seem to turn the figures on the counters from icons to more cartoony figures. Overall, however, the physical presentation is impressive. The scenarios are a varied lot, though not surprisingly, PTO themes dominate (8 out of 12). Actions include: Poland 1939 (Poles vs. Germans), France 1940 (British vs. Germans) & 1944 (Americans vs. Germans), Burma 1943 (Indians vs. Japanese, British vs. Japanese) & 1944 (British vs. Japanese/INA) & 1945 (Indians vs. Japanese; INA vs. BNA vs. Japanese), Saipan 1944 (Americans vs. Japanese ), Namur (Americans vs. Japanese), and the Soviet Union 1942 (Soviets vs. Germans). The scenarios are a mix of small, medium, and large-sized actions, slightly tending towards the small. There are no scenarios that could be considered very large, which may disappoint those DASLers whose stated love of the subsystem is largely due to opportunities for meatier play. The scenarios are small in size in another way as well: in the number of boards that they use. One scenario uses a single board, six scenarios use two boards, four scenarios use three boards, and only one scenario uses four boards. No scenario uses more than that. 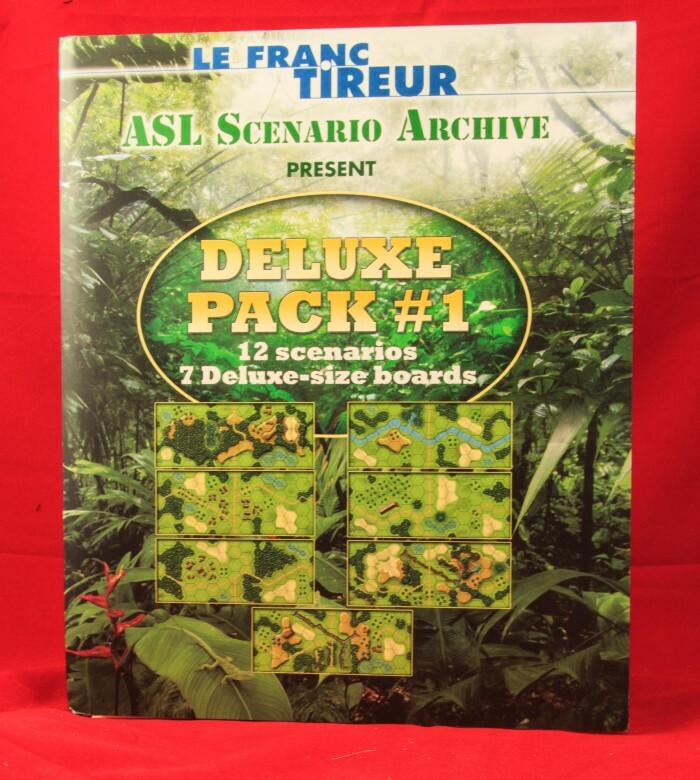 Oddly, only one scenario uses any DASL board other than the ones included in this pack. Two scenarios utilize OBA; no scenarios use Air Support or Night Rules. Several of the scenarios have interesting SSRs or depict interesting situations. In FT207 (The Last Pillbox), the defending Japanese are allowed to choose two special abilities from an array of six possibilities, including a -1 Ambush drm, Fanatic status in buildings, extra Tank Hunter Heroes, and other options. Scenario FT197 (Spoiled Afternoon) is an ultra-tiny “battle of half-squads,” featuring 8 Polish half-squads/crews and 2 AFVs arrayed against 10 German half-squads/crews and a few vehicles. This scenario is a convoy ambush situation, which don’t tend to play well in ASL. 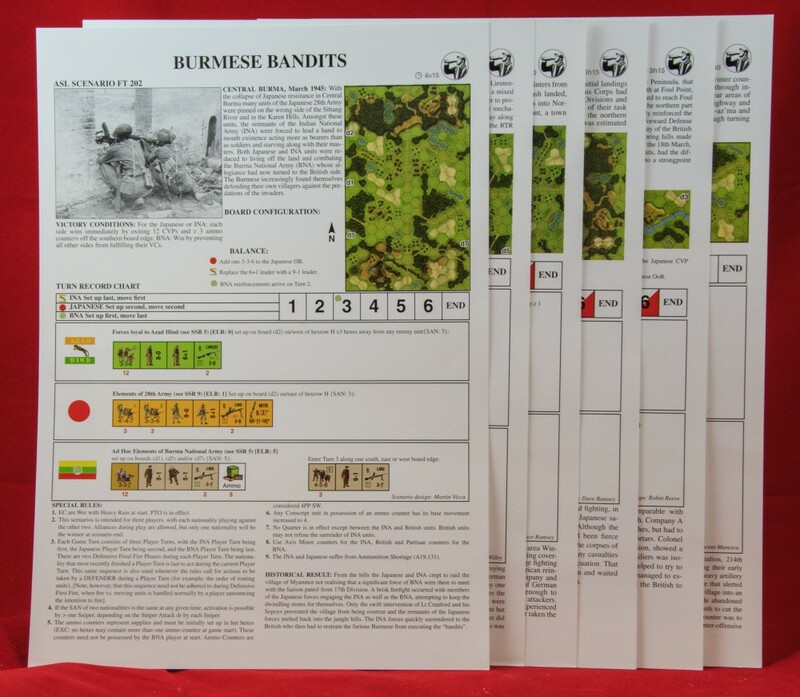 One scenario, FT202 (Burmese Bandits), is actually a three-player scenario (of very vague historical provenance–this is one of the only published ASL scenarios that only give a month and year for the action, not an actual date) set in Burma in 1945, pitting the Burmese National Army (and a few British reinforcements) against its former allies, the Japanese and Indian National Army. 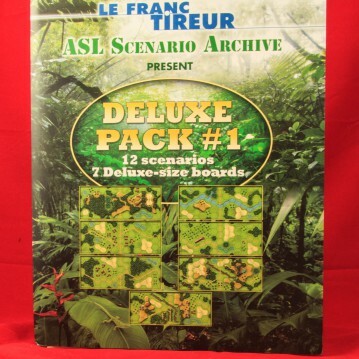 This is the one Deluxe Pack scenario that uses 4 boards (although it should play fairly quickly). 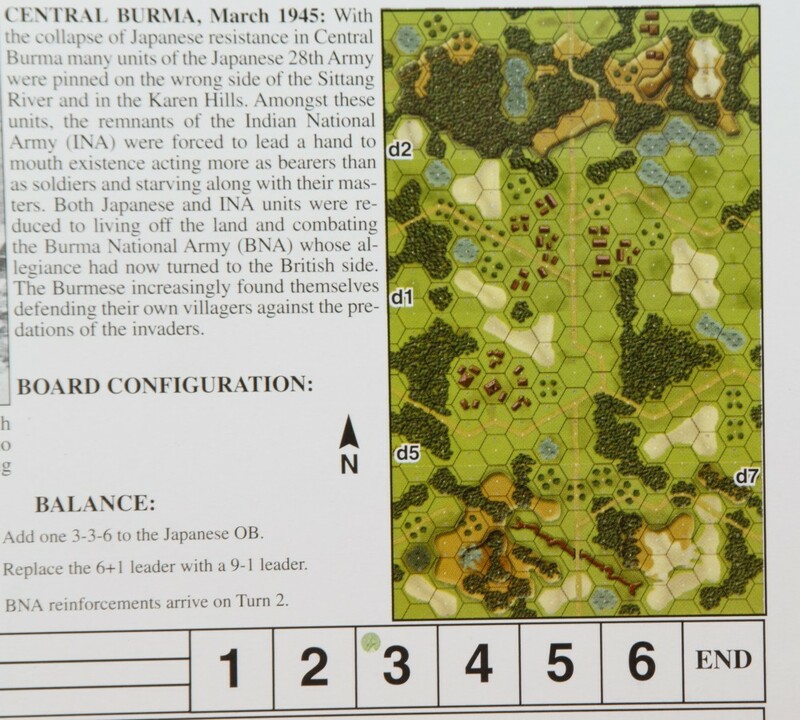 The scenario contains major errata, as the Japanese OB should have 6 3-3-6 squads, not 3 such squads. It should be noted that this product is not cheap; in the United States, it is likely to set an ASLer back about $85 to $95, not including shipping. This dear price, combined with the fact that it is DASL-oriented, may well mean that a number of ASLers might choose to take a pass on it. However, for DASL lovers, this is a worthy addition. This statement could only be written by someone who doesn’t play DASL and doesn’t understand what it represents (and what it doesn’t represent). Primarily, DASL offers the potential for scenarios that would be very difficult in regular ASL due to counter density. That’s partly because of the bigger hexes, of course, but there’s more to it than that. Please don’t be so quick to dismiss what you clearly have little understanding of. >for DASL lovers, this is a worthy addition. I strongly disagree (and I am very much a DASL lover). The artwork is dreadful (if mostly functional) and worse, quite incompatible with original DASL boards, somewhat negating the point of the project. 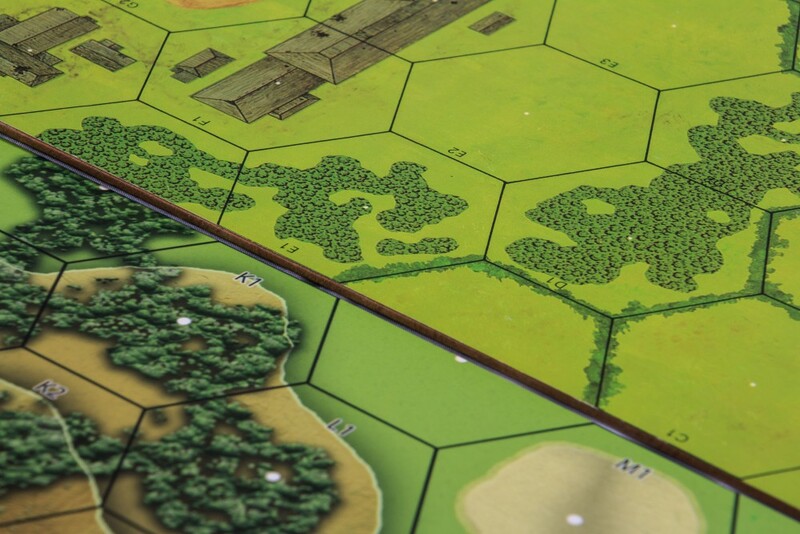 Furthermore, the boards feature terrain types incompatible with Chapter B (or Chapter J). I was told (you don’t mention it in the review) that this would be fixed by notes included in the product, but this only happened as it was being prepared for publication; i.e., this information was never part of the design/playtest process. So the entire design work behind the module is flawed, and if the designer (and playtesters) don’t have a sound grasp of something as basic as terrain, what does that suggest about the scenario designs themselves? The INTENT behind this product was admirable, but the execution is IMO fatally flawed. I’d pay almost any price for a good DASL expansion (the required board size etc. means that no such product could ever be “cheap”), but I’m keeping my wallet closed for this one. Agree wholeheartedly with Bruce’s take on the maps. One other issue with them is they are printed “off-center,” for want of a better term. The folds don’t run down the center of each board, but are offset a bit to one side, with the result being that the boards don’t line up evenly when one “flipped” board is mated to another. This is not a problem with simple arrangements of a single row or column of boards, but bigger configurations would have gaps. Many thanks for the helpful review and critique of the maps. Just saved me $100+ CAD. without exception encouraged people just like me to achieve their desired goals. I like this weblog very much, Its a real nice post to read and obtain info. particularly since I was looking for thoughts on this subject last Friday. Good web site! I truly love how it is simple on my eyes and the data are well written. I’m wondering how I might be notified whenever a new post has been made. The Two Half Squads Podscast! ASL podcast is an ASL product!